A project developed by arch. Moreno Zurlo from Acme Studio (Verona). The location is set on the slope of a hill, in the heart of a wide natural amphitheatre in an area which has always been dedicated to the plantation of vines and olive trees. The property is very extended and position chosen for the new building is right in the centre of the productive activities of the owning company. Refusing to look back at outdated models, the project is meant to work as a “utensil”, a modern tool suiting the new technologies from the world of vinification. At the same time, architecture perfectly blends with the environment, as it has been designed to hide below the soil surface. 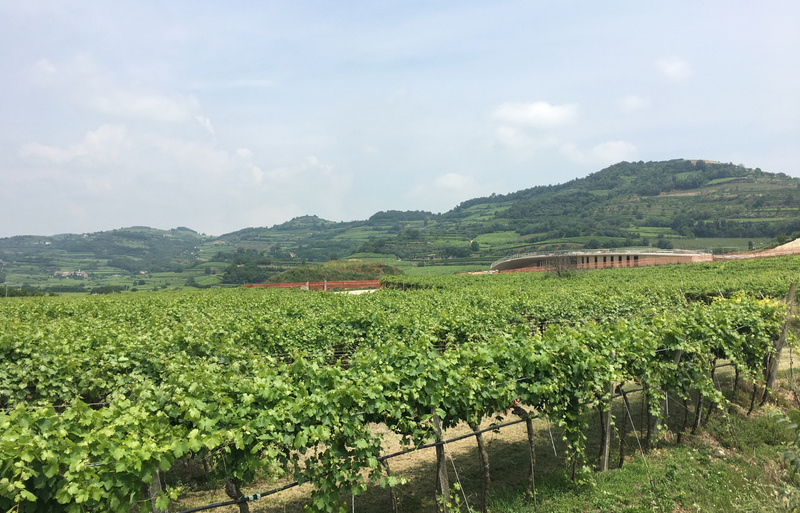 The landscape is characterized by stone walls, vineyards, cultivated fields, woods and orchards that, together with the curvilinear shape of the hills and the terraces, create a morphological reference for the integration of the project in the surrounding environment. The building is positioned on the point where the plain down the valley bends to follow the slope of the right bank.